Fall has arrived and with it comes even more indie rock greatness! It’s Andy Gesner and the staff from HIP Video Promo, here to share with you the sort of video that you really only discover when you’re working with cutting-edge, indie artists. Every now and then a clip crosses this desk that’s so hypnotic and intriguing that we just can’t stop looking at it – a video that keeps playing in your head even after you’ve ejected the tape from the VCR or DVD player. Ramon Bloomberg’s fascinating clip for “Private Shipwreck” by Salem, Massachusetts-born songwriter Luke Temple is such a video. Bloomberg’s hallucinatory vision is a perfect match for Temple’s work. Luke Temple is a fevered, soulful, and passionate writer with songs that frequently feel like transmissions from a strange parallel dimension. Unafraid to use odd voicings and challenging chord progressions in his pop-folk songs, Temple has already earned a reputation as one of the most singular singer-songwriters to have emerged out of New York City in the past few years. The national press has noticed: Rolling Stone praised his debut as “a collection of songs that even the most jaded anti-folk hipster could catch himself humming on the street.” And no less a songwriting authority than Death Cab For Cutie frontman Ben Gibbard has lauded Temple to the rafters, touting his pop sense, his otherworldly singing voice – and his camera-ready good looks. Hold A Match For A Gasoline World, Temple’s debut album, has only been out for a few months, but it’s already drawing raves. For the aficionados who run the most discriminating web publications, his songwriting has been the main attraction. 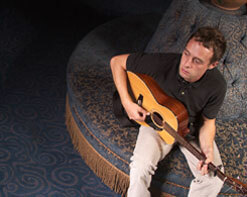 “Temple happens to know exactly what to add to a song to allow it to pass the threshold from ‘nice’ into ‘wonderful’”, writes Mike Schiller in PopMatters; to Nate Lippins in The Stranger, his music is “beautiful but understatedly natural, like the best folk-based pop.” “Private Shipwreck”, is, in many reviews, singled out as an exceptional composition – a standout among pop gems. It’s easy to see why: it moves from an offbeat yet engrossing verse to a chorus that simmers with explosive energy. It’s all sung in Temple’s radiant tenor, an instrument capable of great expressive range. Ramon Bloomberg, the director of the “Private Shipwreck” clip, is no stranger to the task of matching images to compelling subject matter. He’s directed videos for some of the most creative bands in indie rock, including Supersystem and Metric – but he’s probably best known for his award-winning documentary Area K, about the intifada in the Gaza strip. Clearly, this is a filmmaker with cinematographic skills, and with many ideas to express. He brings the full breadth of his training to the gorgeous, fascinating, and cinematic “Private Shipwreck” video: a clip that wouldn’t look out of place between Jim Jarmusch films on The Sundance Channel. It follows several characters (one of them is Temple himself, who more than fulfills Gibbard’s camera-friendly expectation of him) through peculiar settings, most of which are in a roadside motel. Some of the rooms, however, are incongruously decorated like cheap Vegas honeymoon suites. On a bed surrounded by mirrors, a soldier in full combat fatigues stares at the wall, swaying gently but nearly motionless. A young woman, a middle-aged couple, Temple himself: they all have a similar impassiveness. We see the couple sitting straight-backed and poised, separated by a bathroom wall; the young woman lies on a bed, staring at the mirrors; the soldier stands by the roadside, mesmerized by the streetlights. It’s all soft, muted, mysterious; it draws you into its web of associations, and seeps, dreamlike, into your consciousness. We couldn’t think of a better way to usher in the beautiful, cool Fall weather than by working with Mike Manning at Mill Pond Records to bring you this fascinating new clip. We have plenty of copies of Hold A Match for A Gasoline World CD’s for on-air giveaways and your listening enjoyment, along with cool Luke Temple posters and buttons. If you need more info, call Andy Gesner at 732-613-1779 or e-mail us at HIPVideo@aol.com. You can also visit www.MillPondRecords.com to find out more about Luke Temple.